Working at a language school in Costa Rica may sound like a dream short-term job. But before signing any contract, ask first whether you’d be expected to hide in the bathroom if immigration police show up. On Feb. 26 Immigration Police raided the Máximo Nivel language school in the San Pedro neighborhood of San José. In all, 12 U.S. tourists between 18 and 21 years old were ordered to hand over their passports and report to the Immigration Administration to verify their status in Costa Rica. The 12 tourists who studied and taught at the school were informed last week that they had 72 hours to leave Costa Rica, Immigration Administration spokeswoman Andrea Quesada told the Tico Times. Authorities allege that the students were working as instructors without proper work permits, in violation of Costa Rican immigration law. Máximo Nivel’s owner, Ken Jones, said that the 12 individuals were studying and doing community service in Costa Rica, not working. Still, former Máximo Nivel employees told The Tico Times that the company has hired international tourists to work under the table in the past, and asked them to hide their status — literally — from authorities. 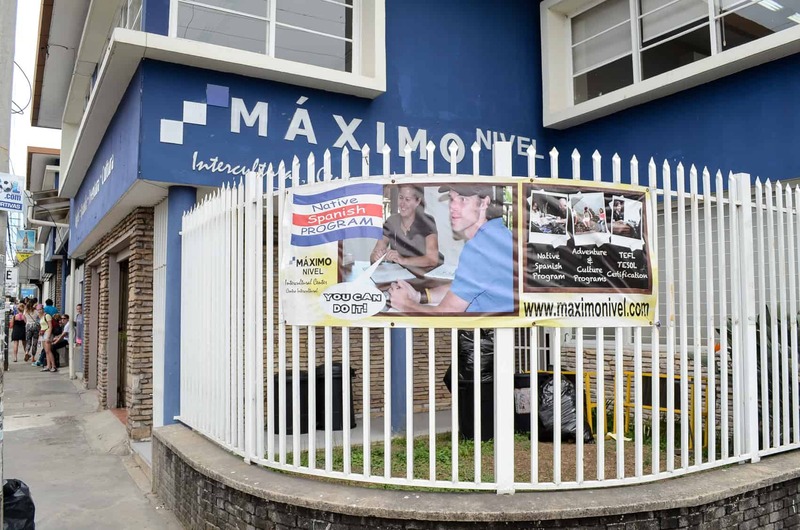 Two former Máximo Nivel employees, who agreed to speak to The Tico Times on the condition that they remain anonymous, said they knowingly worked under the table for the language school for months at a time without formal work permits. The sources asked to remain anonymous because of their relationships with current Máximo Nivel staff. Both former employees said people working illegally at Máximo Nivel had been asked to hide in a back room when government inspectors arrived. One of the employees said she was told to go out a side door and not come back to work on a day when inspectors arrived. She said Máximo Nivel employees without work permits were told by management that they were responsible for maintaining a legal tourist visa, which involved leaving the country every 90 days, but that the company would not sponsor a work permit. The former employee, who began working for Máximo Nivel in 2013, shared her job offer from the language school with The Tico Times. The offer was sent from Jones’ Máximo Nivel email account. Jones denied the alleged subterfuge, and said he wasn’t aware of employees being asked to hide from immigration authorities. “None of that is something that I would have knowledge of. It sounds funny,” Jones told The Tico Times. He said that all his staff are legally employed. Máximo Nivel advertises courses taught by native English speakers on its website. The school offers English and Spanish classes, and language teaching certification. Máximo Nivel also organizes homebuilding, environmental conservation and healthcare volunteer opportunities for students. Jones said that instructors are typically students seeking certification to teach English as a foreign language, known as TEFL. Part of that certification involves a teaching component but students are not paid, Jones said. Students typically attend Máximo Nivel’s TEFL courses on a tourist visa, he said, which was the individual student’s decision. Costa Rica does offer student visas, but immigration law requires a letter of acceptance from an academic institution in order to apply for one. When asked what kind of work permits Máximo Nivel offered its international staff and how staff were compensated for work, Jones declined to comment, saying the company’s human resource policy was confidential. Jones said that Máximo Nivel contributes $10,000 monthly to the Costa Rican Social Security System, commonly referred to as the Caja, and provides $350,000 to local host families for students annually. One of the former employees who spoke to The Tico Times specifically referenced the school’s community service opportunities as one of the reasons they chose to work there, regardless of the lack of legal immigration status. The Immigration Administration has taken a hard line on the status of the 12 individuals rounded up at Máximo Nivel in February. “Someone who comes to Costa Rica on a tourist visa only has permission to, well, be a tourist here,” Quesada, the Immigration spokeswoman said in a telephone interview. She noted that there are specific visas for tourism, study and volunteering. Even if someone is teaching English at the beach for a summer, they are legally required to have a work permit, she said. A tourist can request to change his or her immigration status while in the country, Quesada pointed out. She also said there are work permits for short-term employment available that take less time to get than the lengthy process for obtaining residency. But some employers may not be fully versed in Costa Rican immigration law. Anna Karina, a lawyer with the firm Arias & Muñoz and director of the Costa Rican-American Chamber of Commerce’s Human Resources Forum, said some firms are unaware of the various options for work permits and visas. Others simply may not be willing to commit the time and resources to get them, she said. If businesses in Costa Rica plan on hiring foreign nationals on a regular short-term basis, they should consider registering as a “known business,” or empresa reconocida, with the Immigration Administration, Karina said in an email. The human resources expert said that this step can help cut application times for new foreign workers. Karina acknowledged that Costa Rica’s immigration laws can be labyrinthian and recommended hiring a lawyer who’s knowledgable about the system. Despite the inconvenience, the 12 people rounded up at Máximo Nivel in February were told that they could re-enter Costa Rica as tourists. The Immigration Administration has not taken any additional sanctions against them or Máximo Nivel, according to an email from Immigration Administration spokeswoman Andrea Quesada. It’s hardly just language schools that hire employees under the table. According to the most recent State of the Nation report, more jobs were created in Costa Rica’s informal sector — jobs without government-mandated healthcare, vacation time or legal work status — than in its formal sector in 2013. The 2014 National Housing Survey reported that more than one in three middle and upper class Costa Ricans surveyed work in the informal sector. That number jumped to 72 percent for those living in poverty. Working under the table is common for tourists looking to scrape together enough cash for a longer stay on Costa Rica’s beaches, and for some perpetual tourists who have made a life for themselves here, but never formalized their residency. But it’s still illegal.